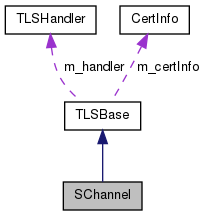 This class implements a TLS backend using SChannel. Definition at line 44 of file tlsschannel.h. Definition at line 22 of file tlsschannel.cpp. Definition at line 28 of file tlsschannel.cpp. Definition at line 233 of file tlsschannel.cpp. Definition at line 109 of file tlsschannel.cpp. Definition at line 35 of file tlsschannel.cpp. Definition at line 246 of file tlsschannel.cpp. Definition at line 463 of file tlsschannel.cpp. Definition at line 465 of file tlsschannel.cpp.